Discussion in 'Ban Appeals Archive' started by OfficerWade, Jun 15, 2018. Did you read the rules (Discord Rules)? Was this an incorrect ban? Were you ever banned before on Discord? If so, what for? 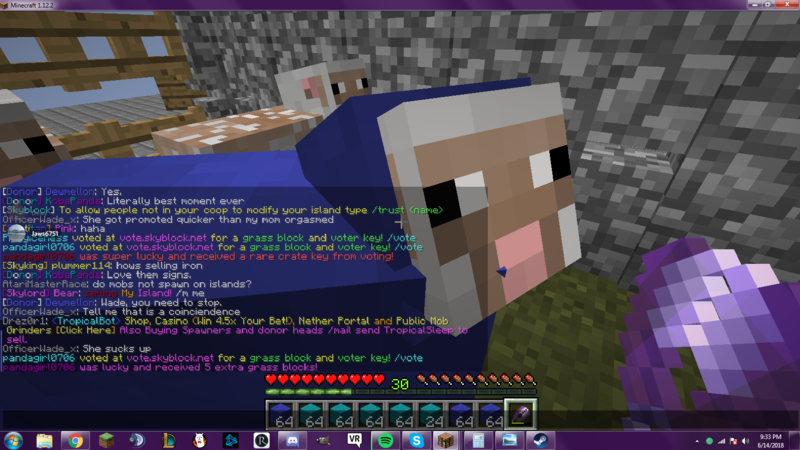 I should be unbanned because I was not kicked before my ban. 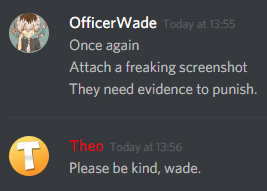 Thank you for taking the time to appeal, Wade. I'm more than happy to go over why I thought this was an appropriate course of action. I have warned you, time and time again, as evidenced below. I'm not the only one who has warned you either. I'm sorry if somehow five separate warnings from three separate moderators are not enough for you to understand that something is against our rules: I'll make sure to take into account your learning speed next time. However, I do believe that five warnings should have been more than equivalent to a kick, and should have made you realise that what you were doing was wrong, and, especially given I explicitly stated that it was your final warning (i.e the one before a ban), there's no way that kicking you would have changed what happened at all. Because we're apparently laying all cards on the table here, I'd like to add some high-quality behaviour you exhibited shortly after being banned from discord, which exemplifies your inability to understand punishment for bad behaviour, and a complete lack of remorse for your actions. I wouldn't punish you for the attempt at offending me: I can assure you that it was not, in any way offensive. I'm fascinated to know that you're so experienced with the female menstruation cycle, and I'm happy to hear that you're as proud at my swift promotion as I was. Nonetheless, the attempt, along with the fact that instead of trying to obtain some form of forgiveness for your crimes you instead are trying to make me look bad, leads me to believe that you are not, in any way, sorry for your actions. Wade, I told you to appeal. This was because I assumed, perhaps optimistically, that you would be honest here as you were with me when we spoke. I'm very disappointed that this was not the case. Because you're accusing me of failing my duties as a moderator, it's not my place to close this appeal. However, if it is decided that my ban was justified, I will deny your appeal. I came here willing to compromise, but it seems that you have forced my hand. I'll make sure to take into account your learning speed next time. And no, your punishment is false. I am guaranteed a kick before a ban, and was not offered that. This was all a bias situation on your behalf. I should be dealt with the same as any other player. No reason for me to be banned immediately. I assure you I would not have acted differently had it been any other player. I have nothing against you Wade, and even if I did, I'm not the person who would compromise my position out of spite. Nonetheless, I've already requested for another moderator to look over the appeal, to avoid bias and because this is half some kind of report against me. I'm sure they'll get back to you soon. You’re dismissing the fact that you did not kick me as instructed, and as I am guaranteed in rules. Can you explain why you went straight to a ban? I am guaranteed a kick before a ban, and was not offered that. 3 warnings from Lycel, 1 warning from Theo, 1 warning from myself. Instead of complaining that you didn't get a kick, you should be grateful that you got 5 separate warnings instead of the cut and dry kick/ban. If anything, you got 4 extra chances to change your behavior. We were very lenient and tried to give you chance after chance, but instead you continue to act very inappropriately. Unfortunately, thats not ok.